In a little over two months, I have formally reviewed 25 beers. You can see all of the reviews by clicking here. I've tasted quite a few more, but never got around to writing the all of the reviews. So to celebrate this mini-milestone I thought it would be fun to look at the all of the reviews I have written, and create a "word cloud" that shows which words I used most often. I used a free web tool called Wordle (http://www.wordle.net/). It's really easy and fun to use. I just copied and pasted all of the text from my reviews into Wordle and it cranked out the chart below in just a few seconds. 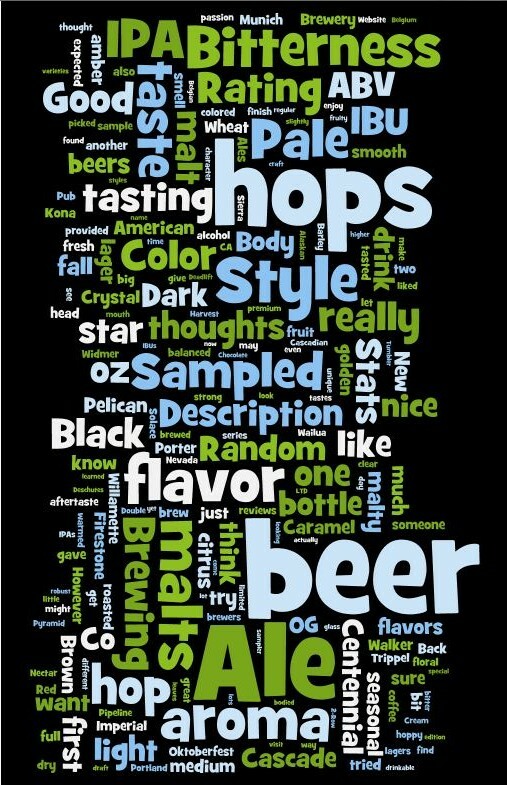 The words in the biggest font are the ones I used most often--works like beer, ale, hops, aroma, style, etc. Nothing too out of the ordinary for a guy who blogs about beer. Fortunately for me, words like nasty and swill didn't float to the top. Looking forward to the next 25 reviews. Cheers!